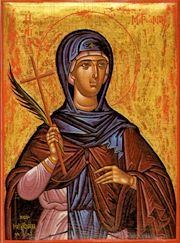 This martyr was the servant of a certain Jewish woman named Pantilla, the wife of the Governor of Thessalonica. When Matrona refused to follow her mistress into the synagogue Pantilla beat her so severly that she died in a few days, and thus received the crown of her confession. Share the feast of The Holy Matrona of Thessalonica with an icon greeting ecard.